Gretchen Gehrett, founder and President of G2 Marketing, has over 20 years of marketing and advertising experience in senior level positions at Fortune 100 corporations. For G2’s consulting clients, she uses her expertise in product development, brand building, and advertising to produce research and marketing strategies that lead to successful, dominant brands. As Vice President of Advertising and Communications at MCI and Vice President of Consumer Marketing at Chase Manhattan Bank, Gretchen was known for her ability to quickly ascertain strategic yet practical paths to achieve superior results. At MCI, she managed the launch of the highly successful MCI 5-cent Sundays and 5-cent Everyday advertising campaigns, building double the brand awareness with half the spending of competitors. And, she launched the enormously successful airline mileage partner programs. Gretchen’s focus group moderating skills have been honed throughout her career. Her hands-on marketing experience gives her a unique advantage in the focus group room—there is both a marketing expert and a trained moderator directing the discussion. 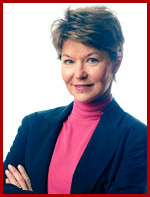 Gretchen also has extensive training from RIVA Institute, the premier qualitative research training facility. Gretchen holds an MBA from Cornell, has taught marketing and brand strategy development at the University of Virginia, and is a member of the Qualitative Research Consultants Association.